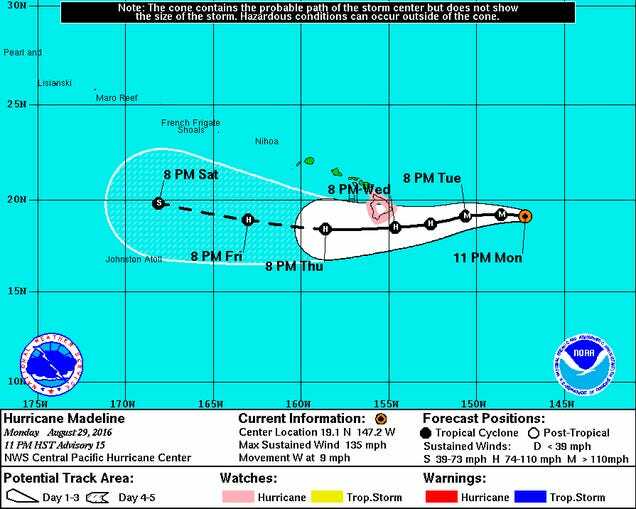 Rumbling west at approximately 9 mph, Madeline is currently packing Category 3 windspeeds of 120 mph. Its latest track has the storm passing south of the Big Island on Thursday, although as meteorologists Bob Henson and Jeff Masters point out over at Weather Underground, it’s too early to rule out the possibility of landfall on the island of Hawai’i. In any case, the storm is expected to bring heavy rains and 40 to 50 mph wind gusts to the island later this week. A hurricane watch is in effect for Hawaii County. Following closely on Madeline’s heels is Hurricane Lester, which also wields Category 3 windspeeds and is slowly gaining ground on its sister storm, moving west at 14 mph. Roughly 1,000 miles east of Madeline at the present, Lester is tracking in a more northwesterly direction, and is expected to pass several hundred miles north of Hawaii on Saturday. Nevertheless, this storm could also bring torrential rainfall and powerful surf to towns and cities that haven’t had a moment to catch their breath. Hurricanes are rare in Hawaii—the conditions that favor their development tend to form more to the south—and to watch two barreling toward the island archipelago at the same time is a first for meteorologists. According to Henson, a combination of ocean temperatures two to three degrees Fahrenheit warmer than usual and favorable atmospheric conditions are to blame. Henson added that long-term ocean warming is part of the story, meaning Hawaii could be in for more hurricanes as the planet continues to heat up. But the atmosphere also needs to be conducive, with very uniform windspeeds so that the storm doesn’t tip over. Right now, the atmosphere is just about perfect, with warm air rising, spreading out, and being hauled away by strong upper-level winds that act as an outflow channel. 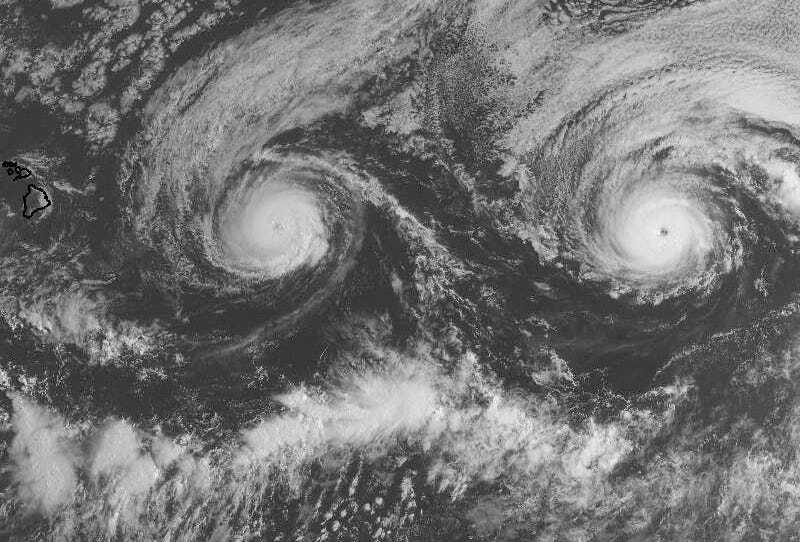 For Hawaii, there is one silver lining to this ominous situation: Nearby cyclones tend to spin around each other, in a phenomenon known as the Fujiwhara effect. “What this means is the one ahead in line gets angled a little to the left, while the one behind is angled slightly to the right,” Henson said. In other words, the Fujiwhara effect could turn Madeline a bit further to the south while nudging Lester slightly further north, steering both storms clear of the Big Island. “The irony is, if if only one of these storms were there, there’d be a bigger chance of a direct hit,” Henson said. Correction 8/30: An earlier version of this article stated that Hurricane Lester is moving east. It is, in fact, moving west. The text has been updated accordingly.